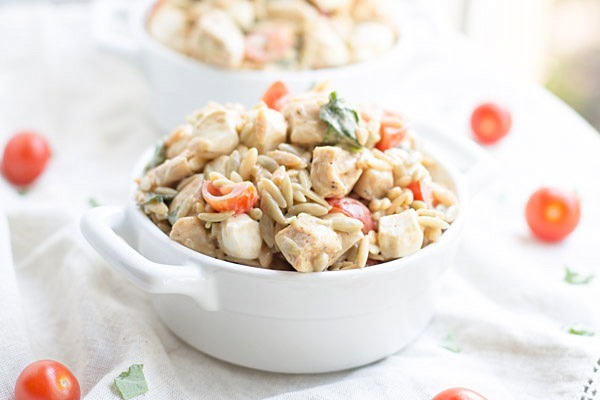 The wonderful flavors of the traditional caprese salad come together to give you this Caprese Chicken Orzo Salad. Enjoy as a main dish or paired with your favorite entree. Remember my quest to eat meat free? That quest has ended. I ate meat last week. And I ate this salad yesterday. It has chicken in it. And fresh basil, tomatoes, balsamic, olive oil and a little mayo. And it’s pretty darn good. I think I would actually prefer this salad without the chicken but it was still good with the chicken. I went back to eating meat because eating meat free was difficult for me. I rarely felt that my hunger was satisfied. I started eating more sweets. I think I was replacing meat with sweets. In the back of my mind, I was telling myself that it was okay to eat more sweets because I wasn’t eating meat. That sort of mentality is never good and often causes problems in the long run. So one Friday evening, I decided to eat meat again. I broiled some chicken and made a southwest style salad. It was delicious and I do not regret topping the salad with that delicious broiled chicken. Fast forward a few days and I may or may not have had a slice of pepperoni and sausage topped pizza. I’m a sucka for supreme pizzas and those pepperoni and sausage slices were topped on one crazy good supreme pizza. But enough about pizza and meat. Let’s move onto salads. In this case, orzo salad. Whenever I make pasta, quinoa or cucumber salads, I always use Pompeian Extra Virgin Olive Oil. If I’m not using fresh lime or lemon juice in the salad, I use one of Pompeian’s vinegars. They give my salads a boost of tartness that I love so much. 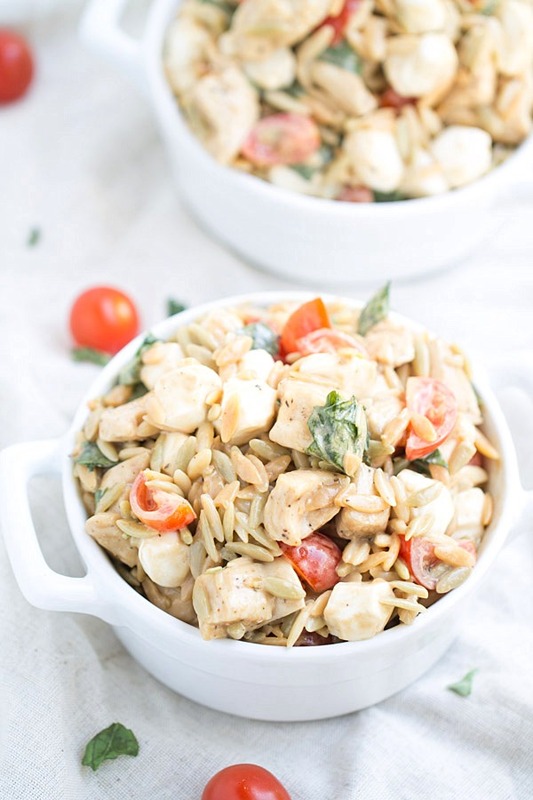 For this Caprese Chicken Orzo Salad, I opted for the balsamic vinegar. Most of you know that a caprese salad is all about the balsamic. While a traditional caprese salad calls for a balsamic reduction, my salad uses balsamic straight from the bottle. To make this salad extra creamy, I threw in about a tablespoon of mayo. If you’re not a fan of mayo, you can leave it out. The mayo mellows the tartness of the balsamic. If you leave it out, you may want to adjust the olive oil and balsamic quantities to align to your taste preferences. If you’re feeling like seafood, replace the chicken with shrimp or scallops. If you don’t want meat, leave out the chicken and replace with extra tomatoes or your favorite vegetarian protein. 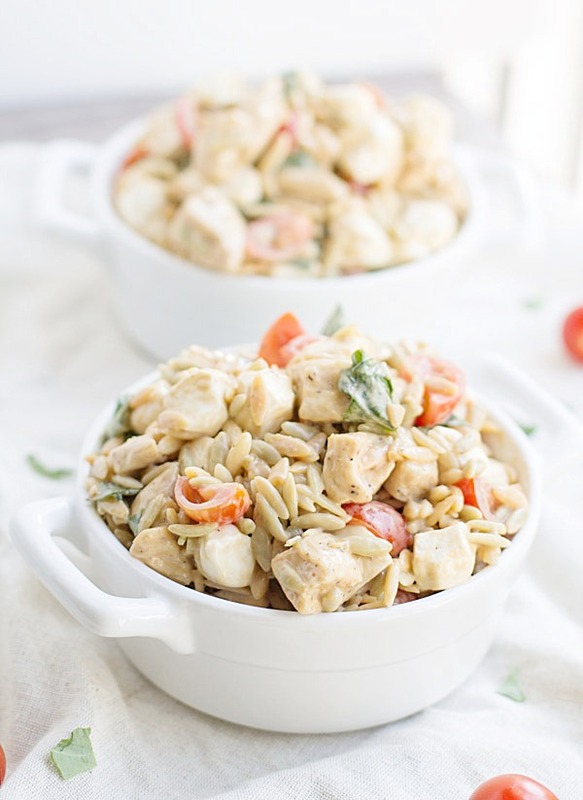 In a large mixing bowl, mix together the orzo, chicken, tomatoes and basil. In a smaller bowl, whisk together the balsamic vinegar, mayo and extra virgin olive oil. Pour over the chicken/orzo mixture and mix well. Add the seasoned salt and pepper and mix well. Taste and add more salt and pepper, if desired. Mix in the pearl mozzarella. Store leftovers in an air tight container in your refrigerator for up to 5 days. I’m participating in the #PantryInsiders program on behalf of Pompeian and Hunter PR. While I have been compensated for my participation in this program, please note that all opinions are my own. And I really do love Pompeian products! Orzo is really popular in Greece but while living there for many years I only ever ate it hot. I really like the idea of a cold orzo salad, especially a lovely one like this with cherry tomatoes and balsamic. Lovely – and so easy, too. I can go for too long without eating chicken either because oh well, I start craving all thing carbs and sweet as well! I eat lots of vegetarian and vegan meals, yes. But I’ve found that throwing in some chicken and fish every now and then is what works well for me ;) I hope you find what it suits you better and that it makes you satisfied! 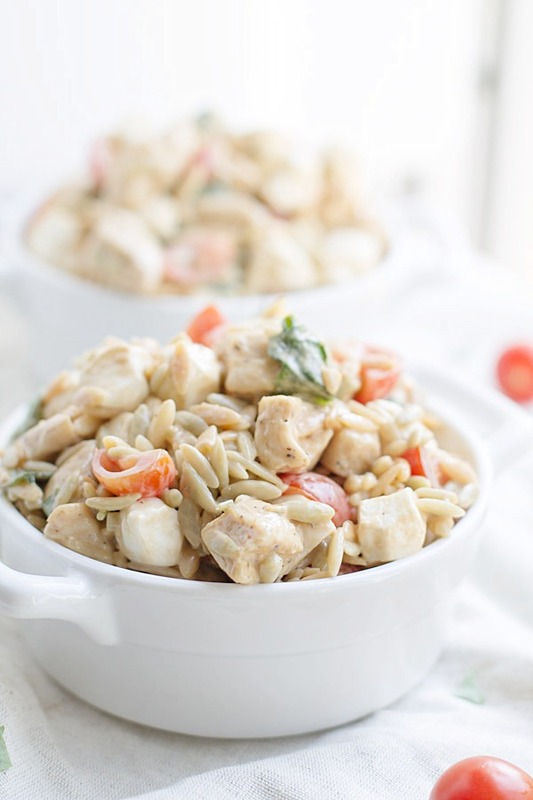 One of my favorite soups is chicken orzo soup, but never thought combining these in a salad. Great idea! Pinned! 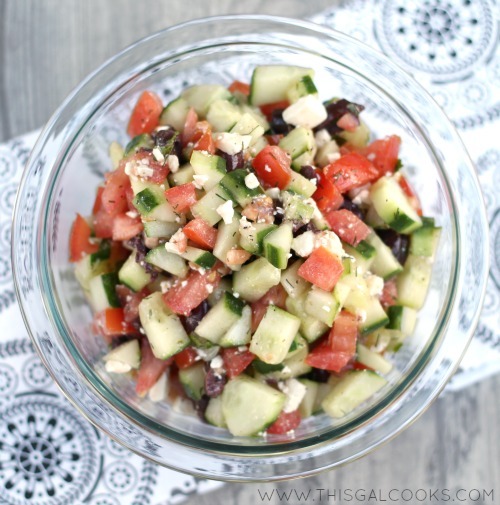 This is just the type of salad that I have been craving – fresh and satisfying! Love the pics too! Julie that looks like the absolute BOMB – we have a little challenge going on here at our house and, while we can eat meat, the orzo might be out for a month, but as soon as that month is up you can be SURE I am all over this (and I KNEW I should have waited to read it, darnit!!). lol Pinned! Julie, you are too funny! It would be hard for me, too! 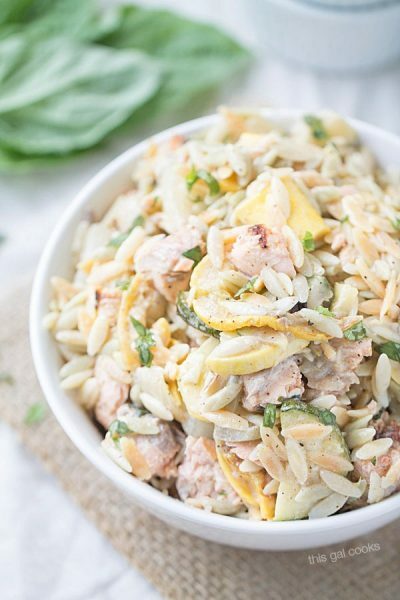 Loving this recipe with the chicken in with the orzo! And, I must say… your photos are rockin! 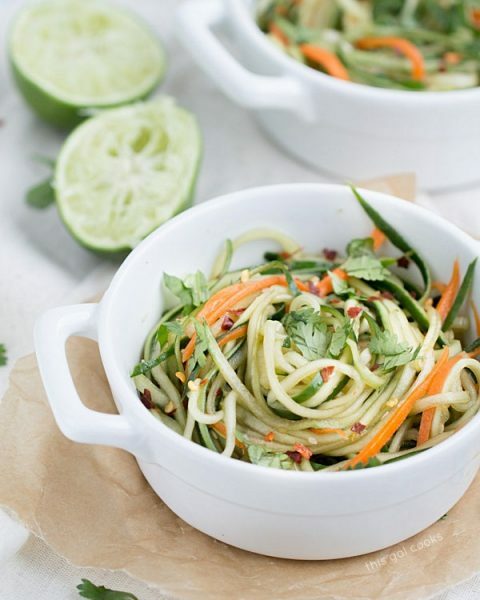 Julie, so glad you are eating meat again and creating recipes like this one!! It would be a HUGE hit in our home!! And, so GREAT for summer!! Oh, YUM! This sounds fantastic! I absolutely love caprese salad, but I never had it using Orzo. I’ve been an on and off vegetarian all my life and it can be difficult, especially when you can’t find a good protein alternative that can help you feel satisfied! Pinning this recipe for later! All I need to see is the word orzo and I’m there! This is my favorite type of pasta, I grew up with it! I love the balsamic vinegar and the caprese flavor! Your salad looks yummy, Julie. So many versatilie ways to use Pompeian. I’ve been hovering on a plant based diet recently. If I say it that way, it doesn’t seem like I’ve giving up anything. Welcome back to the carnivore world, Julie! It’s really hard for me to go meat-free (though we do try to every few days) because I want to carb load. This looks like the perfect combination of flavors! Made it last weekend when it was really hot out. It was easy and delicious. I grilled some chicken breasts earlier in the day. The rest was a breeze and everyone loved it. I wouldn’t change a thing!